At 7,634 feet of elevation, the villageof Arroyo Seco, located between Taos and Taos Ski Valley, is a small, vibrant community that offers, as the locals say, un poquito de todo, a little bit of everything. Arroyo Seco Mercantile carries “new stuff, old stuff and stuff you need.” This is the store’s motto and the inventory does justice to it. Folk art, clothes and ornaments from all over the world have come together in this kaleidoscopic space. There are silk kimonos fromJapannext to colorful Mexican piñatas, and pyrite fromPerunear Guatemalan beaded bracelets. Among the Native American designer jewelry, a set of silver necklace and earrings shines temptingly under the counter. Kids won’t leave the store empty handed—there are wagon wheels, candy and tons of toys. Many Taoseño artists show their work in Santos y Más (Saints and More). “We have good prices and 99% of our products consist of local folk art,” said artist and owner Ray Romero, who is also interest in recycled art. He sells paintings and retablos as well as ski clothes and equipment (helmets, goggles and sunglasses) and even furniture. Crosses and nichos of different sizes and price ranges (from $15 to $300) cover an entire wall. A Virgin of Guadalupe made of stained glass, a creation of Natham Resa, stands out because of its delicate beauty. A scale model of the Cuesta Church done by Pete Bernal is full of charming details, including a Bible on the altar, several pews and a woman kneeling in prayer. Opened in October 2010, Santos y Más is one of the most recent additions to the Seco community. For the ladies, there is one chic, cozy boutique—Francesca’s. Full of stylish clothing and accessories, you can come out of it with a completely new outfit (shoes included) without spending over a hundred dollars. Check out the super cute ballerina shoes, the wrap pants and the soft, flowing skirts in bright summery colors. There is also an ample selection for kids. “We have something for everybody,” Francesca said. If it is getting hot, then it’s time to stop at Taos Cow, located right across the street from Mercantile. It serves breakfast and lunch, but its main attraction is ice cream which comes in an assortment of up to forty flavors. Voted one of the top ten ice cream shops in American by Bon Appétit Magazine, Taos Cow sells a delicious, fresh, rBGH-free, all-natural ice cream that will melt in your mouth. You’d want to freeze it and take it home by the gallons. If you plan to go on a picnic in the mountains, a few food supplies (lettuce, tomatoes, onions and tortillas) can be bought at the famous Abe’s Cantina and Cocina, established by Abe himself in 1944. But if you’d rather eat something there, la Cocina offers delicious enchiladas and chicharrón burritos. Abe is still behind the counter, in the bar, while the kitchen section is managed by his daughters Lina and Olympia Garcia. Their best-selling item is a large flour taco with chicken or beef. The fruit empanadas, that started to be sold 25 years ago, are also extremely popular. 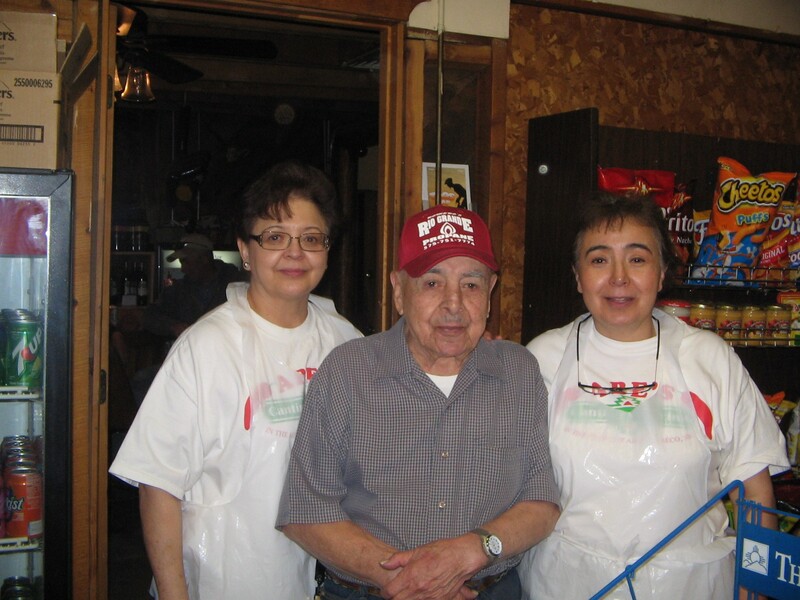 “My mother, Grace Garcia, taught me how to make them,” said Lina. “In Christmas we prepare them with meat and people love them.” The zucchini bread, made fresh by Olympia every day, and her creamy homemade fudge are favorites too. The community appreciated it too. But not only people from Seco buy here. They come from Cuesta and other places to order bulk food, like rice, beans and maple syrup. “They are the Buyers Club,” said Chris’ wife, Ana Woodall. “We have lots of loyal costumers.” If you are staying around this area, it is indeed convenient not to have to run to town to buy just a gallon of milk. The Church of the Most Holy Trinity, that dates back to 1834, has adobe walls, heavy vigas and corbels and an altar where a bulto—a sacred image which shows God the Father, the Son and the Holy Spirit—is still revered. The bulto was found, according to the legend, by three children from the Martinez family, original settlers who built the first houses in the area in 1806. “The settlers decided to dedicate the entire valley to The Most Holy Trinity because The Trinity itself had chosen this place as its home,” said Dr. Larry Torres, a UNM professor and historian who has written extensively aboutTaosand its surrounding villages. The Abominable Snow Mansion is clean, comfortable and inexpensive, with dorm rooms ranging in prices from $12 to $22, plus tax. But “abominable” is the last word that came to my mind when I saw the welcoming communal area, where a cozy fireplace and a piano suggest a quiet, peaceful afternoon. A pool table and lots of toys make sure that nobody will get bored here. If you happen to be in Seco for the Forth of July, don’t miss the traditional parade and street party that starts around noon. There will be open-air concerts, old remodeled Chevys and a plethora of flowers… And this is only a sample of what can be found in this quaint little village where eclectic meets friendly, culture meets texture and tradition meets future. How to get here: Head north on Paseo Del Pueblo Norte/US-64. Turn right at NM-150 —this intersection is known as “the blinking light”. Drive for 4.8 miles and NM- 150 will take you directly into Arroyo Seco.